These flat top trash cans attract enough attention that encourages litter free zones while its clean design seamlessly blends in with its décor. 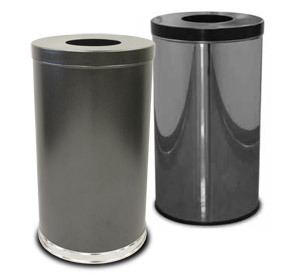 Great for high volume areas, the 35 gallon trash cans are the most popular size for indoor waste collection. The pitch-in open top provides hands-free and sanitary waste disposal for guest and employees alike. Rigid plastic liner is included.